The Egyptian capital is a fascinating metropolis with many different faces. On the one hand it is steeped in history, its own 10th-century foundations pre-dated by ancient landmarks in nearby Giza and Saqqara. On the other, it is sleekly cosmopolitan, with a global culinary scene and world-class art galleries, concert venues and shopping centers. Mosques dominate some areas of the city while others are presided over by synagogues and Coptic churches. Whatever your interests, one thing is certain, there is something in Cairo for everyone. Located in Downtown Cairo, the Egyptian Museum should be the first port of call for any visitor interested in the country’s ancient history. Since 1902, it has been a repository for artifacts unearthed at legendary archaeological sites such as the Valley of the Kings and Luxor. Today, it is somewhat overcrowded with more than 100,000 objects crammed into the 160,000-square-foot space. However, when these objects include the treasures of Tutankhamun and the mummies of famous pharaohs, the ramshackle atmosphere hardly matters. It is open from 9:00 a.m. daily and costs 120 Egyptian pounds per adult. Cairo Tower was completed in 1961 using funds gifted to President Nasser by the United States government as an incentive to support their political agenda. Instead, Nasser used the money to build the tower as a symbol of Arab resistance. Today, it presides over Gezira Island and at 614 feet (187 meters), is the tallest building in North Africa. Check out the mosaics in the lobby, which depict landmarks of the defunct United Arab Republic. At the top of the tower an observation deck and revolving restaurant afford stunning 360-degree city panoramas. Tickets are priced at 60 Egyptian pounds per person. Cairo is famous for historic neighborhoods like Coptic Cairo and Islamic Cairo, but those in search of a little modern culture should head to Zamalek instead. Located in the northern half of Gezira Island, it’s an upmarket area known for its foreign embassies, glamorous restaurants, art galleries and boutiques. SafarKhan Art Gallery is a bastion of contemporary Egyptian art, while El Sawy Culture Wheel hosts an eclectic calendar of concerts, festivals, plays and lectures. In the evening, head to Le Pacha 1901, a floating venue with nine award-winning restaurants and spectacular Nile views. Coptic Cairo’s Hanging Church gets its name from the fact that it is partly suspended above the Babylon Fortress. The current building dates back to the 7th century, and was preceded by another church built in the same spot four centuries earlier. As such, it’s thought to be one of Egypt’s oldest places of Christian worship. Once inside, take note of the vaulted timber ceiling (intended to evoke the interior of Noah’s Ark), the marble pulpit and the incredible collection of religious icons. The church, which is associated with visions of Mary, is open every day from 9:00 a.m. to 4:00 p.m.
Next door to the Hanging Church, the Coptic Museum houses Egypt’s Christian antiquities. These include funerary stelae, frescoes, manuscripts and religious icons, as well as the painted wooden ceilings of several Coptic palaces. Many of the museum’s finest sculptures and reliefs document the movement of ancient artists away from Greco-Roman influences to inspirations taken from scripture. Look out for Jeremiah’s Pulpit, a fabulously ornate ambon salvaged from a monastery in nearby Saqqara, the necropolis of ancient Memphis. The museum is open from 9:00am to 5:00pm and costs 40 Egyptian pounds to enter. Also located near the Hanging Church, Ben Ezra Synagogue was originally designated as a Christian church. In 882 it was sold to Ben Ezra, a Jew from Jerusalem, in order to help pay taxes levied by the city’s Muslim rulers. The synagogue became a place of pilgrimage for Jews from across North Africa, who believe that it stands on the spot where Moses was discovered and adopted by the pharaoh’s daughter. The current synagogue is a 19th-century reconstruction of the original, and visitors can step inside to view beautiful geometric and floral motifs inspired by the Ottoman Empire. There are countless mosques in Cairo, but if you can only visit one it should be Al-Azhar, the first and most influential of them all. Commissioned in 970 just after Cairo’s foundation, the mosque is the oldest Fatimid monument in Egypt. 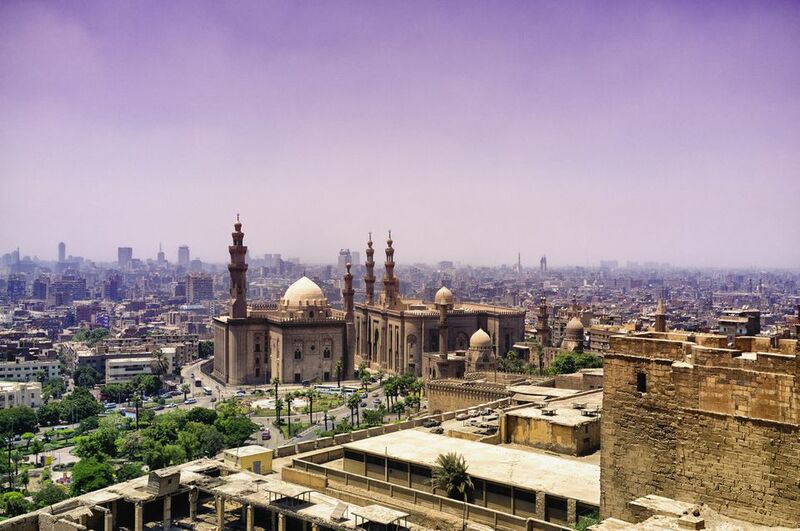 It is also home to Al-Azhar University, one of the world’s oldest continuously running universities and a prominent center of Islamic learning. Although much of the mosque is closed to visitors, non-Muslims can step inside the prayer hall and the white marble courtyard, which affords stunning views of the minarets. Admission is free and respectful dress is essential. One of only three remaining gates in the walls of the Old City, Bab Zuweila dates back to the 11th century. Its twin minarets once served as a vantage point for viewing approaching enemies, and during the Mamluk dynasty the gate doubled as an execution site. Today Bab Zuweila is home to exhibits that detail its fascinating history. These include a section of the original wooden door studded with teeth left as offerings by visiting travelers. Those with a head for heights should climb up the minarets for breathtaking views that stretch all the way to the Cairo Citadel. Admission costs 15 Egyptian pounds. Khan Al-Khalili bazaar is a magnificent souk with the power to transport you back in time to its 14th-century foundation. A sprawling labyrinth of stalls assault the senses with the scent of spices, the sound of vendors hawking their wares and the glimmer of polished copper lamps and silver jewelry. Make sure to haggle enthusiastically for the best price. The most effective way to soak up the souk’s atmosphere is to let yourself get lost; and after stocking up on souvenirs, to stop at one of the cafés for a cup of traditional Egyptian tea. Damaged in a bomb attack in early 2014, the Museum of Islamic Arts is now open to the public once more. Housed in a beautiful neo-Mamluk building on the edge of Islamic Cairo, it boasts one of the world’s most important collections of Islamic art. Of the more than 100,000 objects stored within, only a handful are on display - including spectacular examples of Islamic carved plaster and intricate inlaid woodwork. Discover rare illuminated Qurans, ceramics grouped by dynasty and carpets, glass and textiles from all over the Islamic world. Opening hours are from 9:00 a.m. to 5:00 p.m. daily. Situated near the southern end of Gezira Island, the Cairo Opera House is the city’s most respected performing arts venue. In addition to hosting touring ensembles from overseas, it’s home to a long list of resident companies including the Cairo Opera Company, the Cairo Symphony Orchestra and the Cairo Opera Ballet Company. Performances take place in one of seven different spaces, ranging from the Main Hall with seating for more than 1,200 people to the atmospheric open-air theater. Check the venue’s website for up-to-date listings of what’s on during your visit. Part of the UNESCO-inscribed neighborhood of Islamic Cairo, the Cairo Citadel is an elevated medieval fortification that perches above the city on Mokattam Hill. Building began in 1176 under Saladin (the first sultan of Egypt and founder of the Ayyubid dynasty) in an attempt to fortify the city against the Crusaders. The Citadel served as the home of Cairo’s rulers for the next 700 years. Today, you can explore a fabulous collection of mosques, palaces and museums. Perhaps the best part of a Citadel tour, however, is the views, which sometimes stretch all the way to the Giza pyramids. In a city notorious for its heavy traffic and frequent smog, Al-Azhar Park is a much-needed oasis. The result of a restoration project that transformed a historic dump site into Cairo’s largest green space, the park is a beautiful landscape of verdant lawns, tumbling water features and al fresco restaurants. Join the Cairenes picnicking at the lake’s edge, or keep an eye out for performances at Al-Azhar’s open-air theater. However you spend your time at the park, make sure to visit the ruins of the medieval Ayyubid Wall which were uncovered during the park’s creation. When you tire of the capital’s historic sights, head to Cairo Festival City Mall in New Cairo for a thoroughly modern retail fix. Spread across three levels, the shopping center boasts an impressive array of Western and Egyptian high street brands and designer outlets in addition to no fewer than four department stores. An outdoor dining hub complete with a dancing fountain and amphitheater offers a choice of 50 restaurants, giving you the chance to sample cuisine from many different countries in a single setting. Other mall highlights include a multi-screen cinema and several kids’ play zones. Cairo’s eclectic restaurant scene features cuisines from all over the world, but while you’re there, don’t forget to try Egypt’s own homegrown favorites. Top-rated local restaurants include Abou Tarek in Downtown Cairo and Zööba in Zamalek. The former is a CNN-featured cult icon with only one item on the menu: koshary. Koshary is an Egyptian staple comprised of mixed macaroni, rice and lentils topped with a tomato/vinegar sauce and crispy fried onions. Zööba also serves a gourmet interpretation of koshary and other traditional Egyptian street food dishes, including baladi bread and ful (slow-cooked fava beans). Egypt’s most recognizable landmark, the Pyramids of Giza, lies on the outskirts of the capital. Here you’ll find three separate pyramid complexes including the Great Pyramid of Khufu, the only one of the Seven Wonders of the Ancient World still standing today. The Pyramids of Giza date back approximately 4,500 years to the fourth dynasty of Egypt’s Old Kingdom, and stand as a monumental reminder of the incredible skill of their ancient architects. In front of the pyramids lies the Sphinx, carved from a single block of stone. Book a tour with a professional Egyptologist to get the most out of your visit. 18 miles (30 kilometers) south of Cairo is Saqqara, the necropolis of the ancient city of Memphis. The pyramids at Saqqara are not as famous nor as photogenic as the ones at Giza, but they are possibly even more interesting. The best-known of them all is the Pyramid of Djoser, built in the 27th century BC during the time of the Third Kingdom. It is the oldest pyramid in the world, and one of the earliest known examples of stone architecture. Its stepped sides became the prototype for later pyramid designs. Several operators run day tours from Cairo to Saqqara. The longest river in the world, the Nile has served as the lifeblood of every Egyptian civilization since ancient times. To get a sense of its timeless grandeur, book a cruise upon its busy waters. Options range from a romantic sunset sail on a traditional felucca, to a multi-day trip to Luxor stopping en route at famous sights such as the Valley of the Kings, Karnak and Dendara. The latter option is a great addition to a Cairo city break, affording you the opportunity to see the best of Egypt’s past and present in a single vacation.